After the US and British led military illegally invaded the sovereign state of Iraq (in 2003), its legitimate government was over-thrown, and its leader – Saddam Hussein – was hung on television at the behest of the United States. By removing the essentially secular Arab Socialist Ba’ath Party from power, under the guise of (‘fighting terrorism’), the West, under the leadership of George Bush Jr and Tony Blair, effectively paved the way for extremists paramilitary groups that were once peripheral political entities in Ba’athist Iraq, to emerge into the bright light of equal armed competition in the country. These groups have brutally murdered, (in the name of god), thousands of Western soldiers, and tens of thousands of Iraqi citizens, (including men, women and children). As the Western military presence in Iraq was planned as a pretentious Judeo-Christian act of far-right power projection, and short-term military occupation, there was never any plan of ‘what should be done next’, after its demonstration of technological superiority, had finally achieved its aim of defeating the State Army of Iraq. This policy of short-termism led to the bizarre situation of British and US forces controlling small geographical areas of Iraq, such as main roads, major towns and cities, and prominent hills, etc, whilst the Taliban continued to control and terrorise everywhere else. As the invasion of Iraq was nothing other than a blatant act of neo-colonialism, the presence of Western troops in the Middle East galvanised young Muslim men across the globe, who were motivated in their tens of thousands by religious impulses, to sacrifice their lives in the cause of fighting the ‘infidels’, and attempting to drive them out of areas perceived as historically ‘Islamic’. The highly industrialised and technologically advanced military forces of the West relied heavily upon their material superiority on the battlefield. This led invariably to the situation of the Taliban resorting to massed infantry attacks (of varying discipline and effectiveness) on relatively small numbers of Western soldiers utilising advanced weaponry. This led to the death of one or two Western soldiers every so often, but invariably to the death of hundreds or thousands of Taliban fighters. Although at the point of military contact the Taliban always lost more than it gained, this policy of pressure was sustained against the West by controlling a very large part of the civil population, either through genuine support, or through the use of terror. Whatever the case, as the West was unwilling to commit its ground forces into other areas, the Taliban could always give the propaganda impression that these ‘foreign’ men from the ‘Madrasa’ or ‘Islamic Colleges of Pakistan’ were welcome in Iraq by the indigenous population, and controlled vast areas through popular support. Of course, many other men from around the world, (including the West), flocked to the Taliban ranks, creating a Pakistani-led, internationalist, pan-Islamic movement, fuelled and sustained through the auspices of Western imperialism. In 2003, and for many years after, the BBC clearly pursued a blanket ‘anti-Taliban’ policy in all its coverage. The death of every British soldier was treated with abject sorrow, and their loss was presented through an air of great respect. Britain is a relatively small island-country that draws its men and women for its foot-solders from its working class. These young people, who come through a modern education system, are then trained to fight in modern warfare, and then sent as combatants to far-flung areas of the world to act as cannon-fodder for political wars started and supported by the bourgeoisie. Today, the Western forces have withdrawn from Iraq and left its people open to attack from all sides. Nothing was achieved other than the removal of the Ba’ath Party, which in its time of tenure, served to keep in check all Islamist extremist tendencies. The Taliban was not defeated, and simply adopted the strategy of ‘out-lasting’ the enemy, which of course they did. The BBC, following the strictures of the current far-right government of the UK, is now pursuing the policy of eulogising the very terrorists they once reported against. To achieve this sleight of hand, the ‘Taliban’ has been renamed ‘Isis’, a catchy, media-friendly pseudonym that gives the false impression that a ‘new’ movement has suddenly, and spontaneously arisen, as if out of the ground, and is now spreading across Iraq and is threatening to wash away the Western founded and supported government, whose poorly trained, and poorly motivated soldiery are proving ineffective in the face of the enemy. Isis is the Taliban and tomorrow the media may well refer to it by another name. The BBC is now presenting ‘Isis’ as the ‘saviour’ of Iraq, even though the behaviour of Isis is no different to those Taliban fighters who killed hundreds of British soldiers. 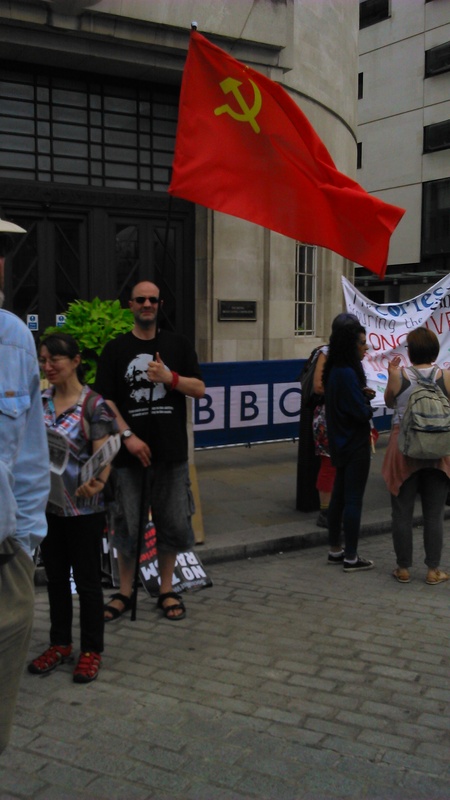 The hypocrisy of the BBC is palpable; as it continues its policy of obviously recannon-fodder, media, soldier-inventing history, which is nothing other than the manipulation of the people through a well established far-right policy.